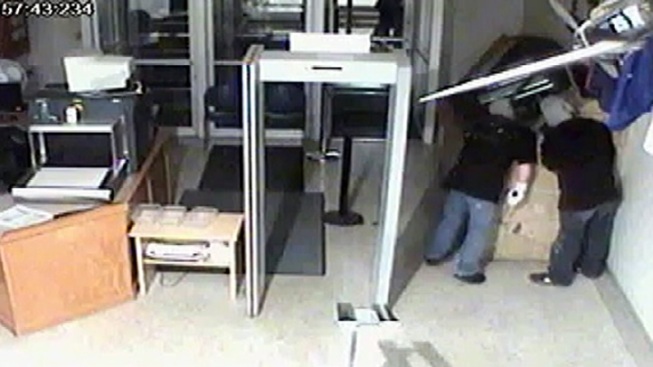 After putting the word out over the weekend that authorities were on the hunt for two East Bay men wanted in connection with stealing more than $1 million in gold from the Siskiyou County courthouse, one of them has surrendered. According to the Siskiyou Sheriff's Office David Dean Johnson, 49, of El Cerrito surrendered and is in custody at the jail there on $1 million bail. His alleged partner, Scott Wayne Bailey, 51, of El Sobrante, is still outstanding. But in a statement, Siskiyou County Sheriff Jon Lopey said that he's hoping now that Johnson is in custody, authorities can "develop additional information" to close the case. After making off with the goods, the suspects allegedly used the money from the sale of the goods to purchase "high-value" items, Lopey said. When detectives traveled to the Bay Area looking for the two suspects last week, they found additional evidence, Siskiyou County sheriff's detectives said, without disclosing what they found. Surveillance footage captured video images of two men breaking into the courthouse but the alarm that was rigged to notify Yreka police and sheriff's deputies did not sound off. A $50,000 reward is being offered for information in the case that leads to an arrest and conviction. Anyone with information should call Det. Yves Pike at 530-842-8354 or 530-841-2900.